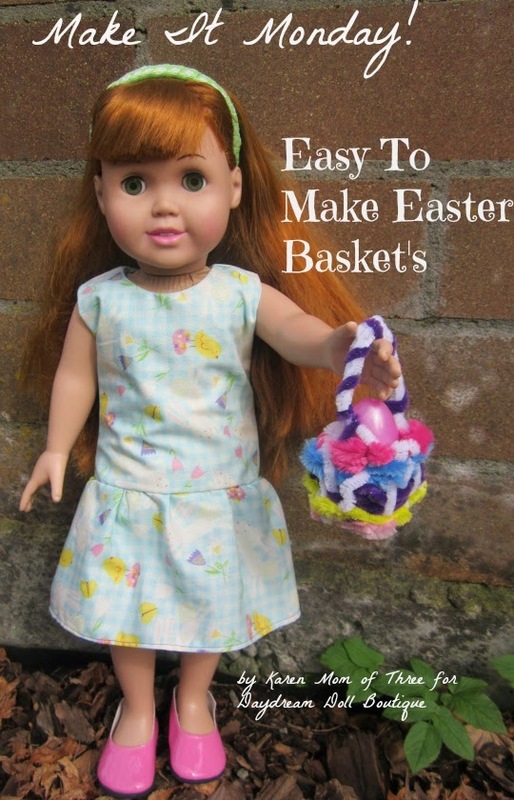 Today in Make It Monday I wanted to share with you an easy way to make your own Doll Sized Easter Baskets! Step 1- cut a toilet paper tube in half, make two snips in the bottom of the tube right across from each other, this will help you form your basket handles. Step 2- Use your pipe cleaner to create a handle and base shape, twist the pipe cleaner ends together at the top. Cut two more snips in the tube across from the ones you made and add another pipe cleaner. Crossing along the bottom and twisting the ends together at the top. Step 3- Remove the tube from the basket shape you have created. Step 4- begin weaving pipe cleaners around the base of your basket form. 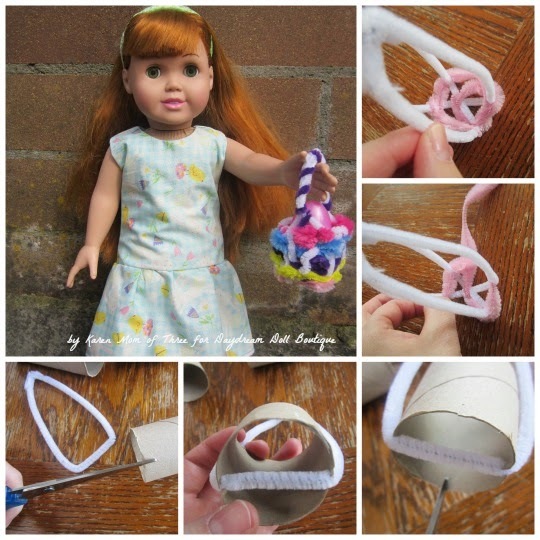 Step 5- Add and alternate your pipe cleaners and twist the ends into the basket as shown in the photo above. Step 6- Once you have added all the colors you wish you can now weave the opposite way around your basket. 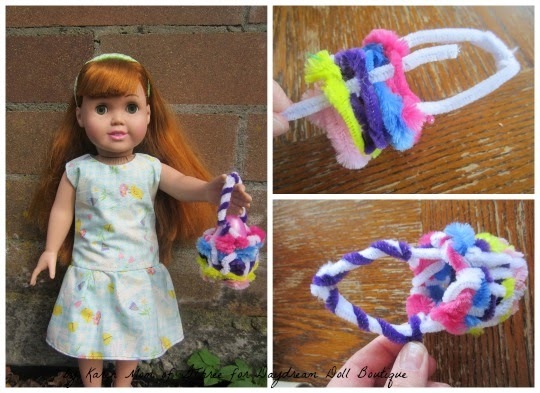 It may take you 3-4 pipe cleaners to complete this weave. 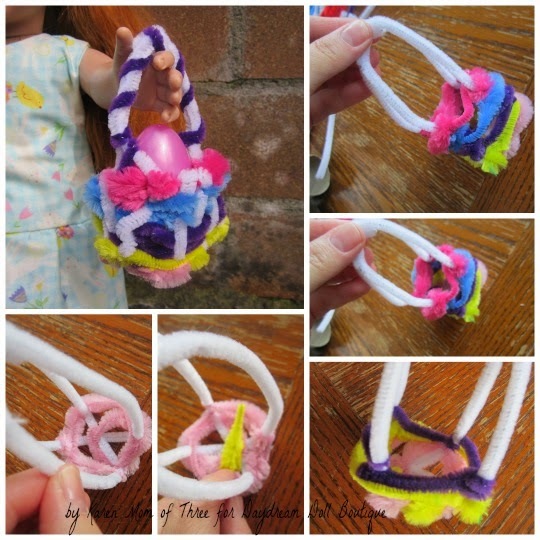 Step 7- Use a coordinating colored pipe cleaner to bring your basket handles together and give them strength. Step 8- Add an Easter Egg and hand it to your Dolly for Play! I hope you enjoyed today's craft! Enjoy your Easter Celebrations!